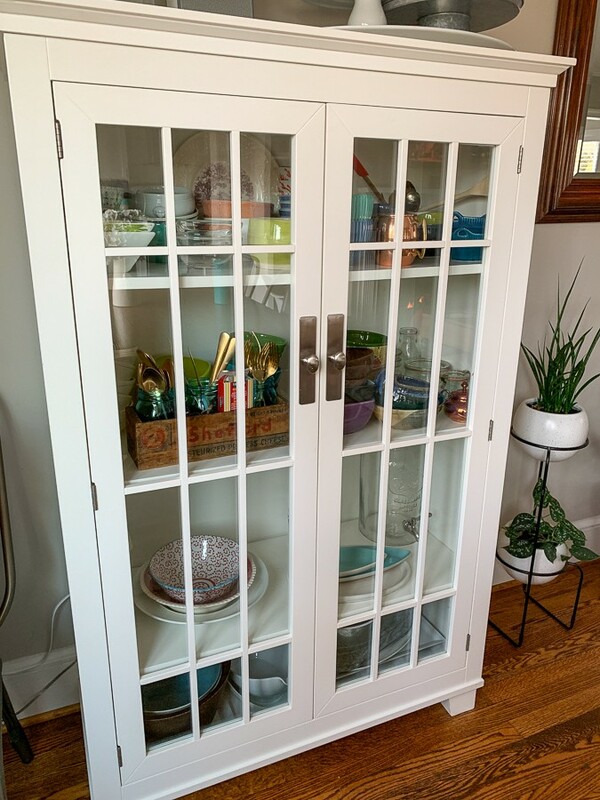 If you go way back into the KERF archives, you’ll find a home improvement post I wrote about adding burlap to a glass-front cabinet to hide what was inside. That cabinet is actually the shorter matching cabinet to our upstairs one. Both are from Crate + Barrel circa 2007! The upstairs, taller one has stored my bowl and entertaining dishes for years. Something about it always bothered me a little bit, and I think the problem was the mix of colors, shapes, and sizes of dishes inside. Plus the fact that no matter how many times I try to pare down my dishes, new ones always appear as gifts and I end up stacking more and more inside. Thus, I decided to make some burlap curtains for this cabinet too! Step one was buying some burlap. I bought a few yards from this online store. Luckily it’s super cheap, so it only cost me about $15 with shipping. I used a yardstick to measure the glass openings and then a sharpie to draw out where to cut. I’m glad that burlap is cheap and that I bought extra because I totally messed up the first try! Because these go inside a cabinet that doesn’t get used a lot, I simply used double sided tape, just like I did with the cabinet downstairs that I burlapped in 2014. I’m happy to say that the shorter cabinet’s tape is just fine, so I’m hoping the new one will stand up to normal use too. I carefully put tape on the cabinet and then smoothed on the fabric. Again since these are on the inside, the edges don’t have to be perfect. Once side two was done – ta-da! Project complete in less than 30 minutes. I’m SO happy with the cleaner look. Thomas noticed as soon as he came home too! He’s a fan.